The mission of Theatre360 is to create and present artistic works that entertain, inform and challenge audiences while breaking down barriers by heightening our community visibility beyond disability. Theatre360 is a troupe of Phoenix-based artists dedicated to the personal, social and political voices of people with disabilities. 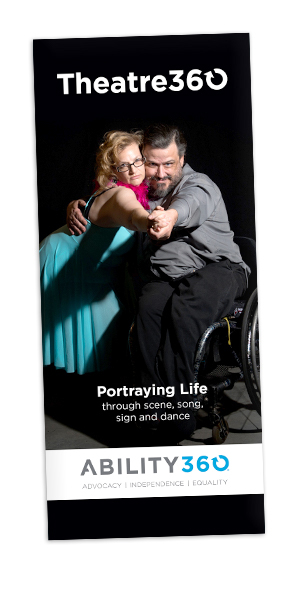 Theatre360 presents original theatre pieces born out of the life experiences and artistry of people with disabilities, along with published plays. Themes, format and length of performance vary based on the works presented and the needs of specific audiences. Post-performance discussions are available to provide forums for dialogue about Theatre360’s artistic process and to explore the artistic voices of audience members. Workshop participants practice what they’ve learned at Theatre360 skills workshops. Theatre360 is always looking for new talent! To accommodate those with Multiple Chemical Sensitivities and allergies, please do not smoke or wear scented products when attending Theatre360 events. Thank you!